This classic Magnum is strong, fast and in excellent condition. It has been owned by the same family for over 16 years and has been treated like a member of the family. 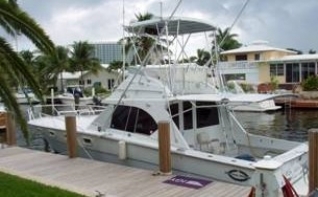 Excellent maintenance and constantly upgraded with lots of TLC. New Yanmar diesels, ZF V-Drives, shafts and props installed 2000 – 2001. Both Cruiseair units replaced. New plumbing. New fiberglass cockpit sole in 2008. New Garmin 4212 GPS/plotter/ sounder/satellite weather. Many other upgrades.